William Edward was the son of James and Elizabeth Lynn, of Coalisland, Co. Tyrone. William Edward was born on 3rd July 1895 in Derrywinnen in County Tyrone. The 1901 census shows William as 5 years old. The family lived at Derry, Tullyniskane, Tyrone. Charles was a railway porter. Elizabeth was a dress maker. The 1911 census shows William as a 15 year old general labourer. The family now lived at Mousetown, Meenagh, Tyrone. William’s father James was now a farmer. Sergeant William Edward Lynn was serving with the 1st Battalion of the Royal Irish Fusiliers when he died on 17th July 1916, age 21. 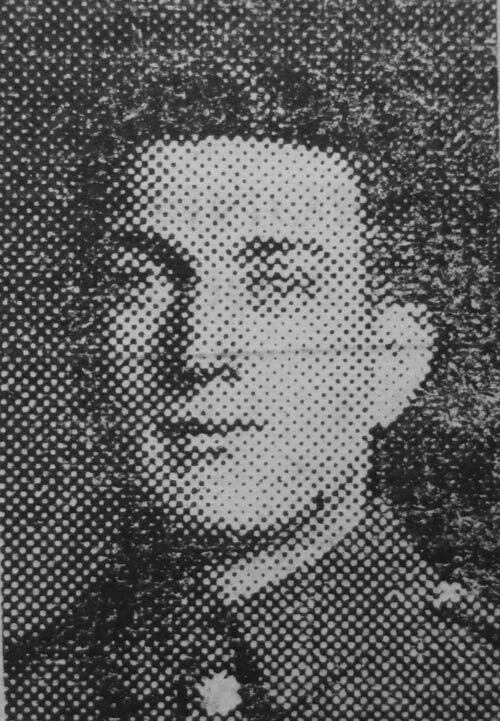 Sergeant William Edward Lynn was one of four brothers who died on service; two are buried in Belgium, one in France and the fourth in Israel. In 1917, a plaque was unveiled in Coalisland Church of Ireland Parish Church in memorial of the Lynn brothers. William Edward was the son of James and Elizabeth Lynn (nee Abernethy). They were married in the Coalisland area on the 20th February 1883. 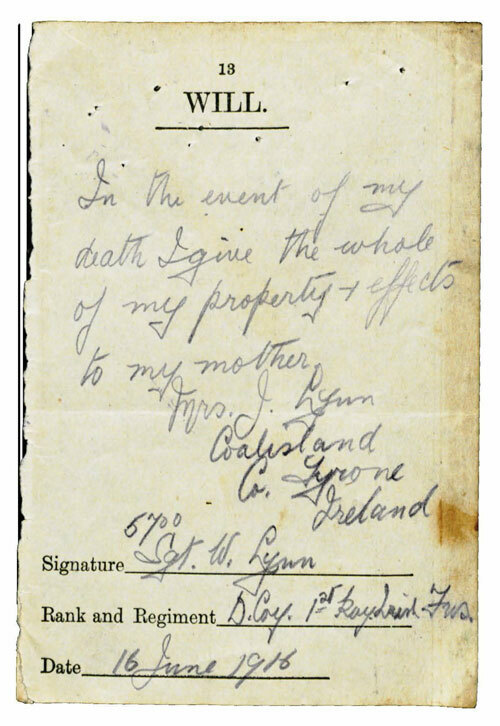 William Edward Lynn was born on 3rd July 1895 in Derrywinnen in County Tyrone. The 1901 census shows William as 5 years old. The family lived at Derry, Tullyniskane, Tyrone. Charles was a railway porter. Elizabeth was a dress maker. Family: James Lynn, Elizabeth Lynn, James Lynn (born 23rd September 1882), Margaret Lynn (born 21st January 1884), Robert Lynn (born 13th November 1885), John Lynn (born 28th October 1887), Mary Lynn (born 27th July 1889), Eliza Lynn (born 5th July 1891), William Edward Lynn (born 3rd July 1895), Charlotte E E Lynn 1 (born 24th January 1900). The 1911 census shows William as a 15 year old general labourer. The family now lived at Mousetown, Meenagh, Tyrone. William's father James was now a farmer. 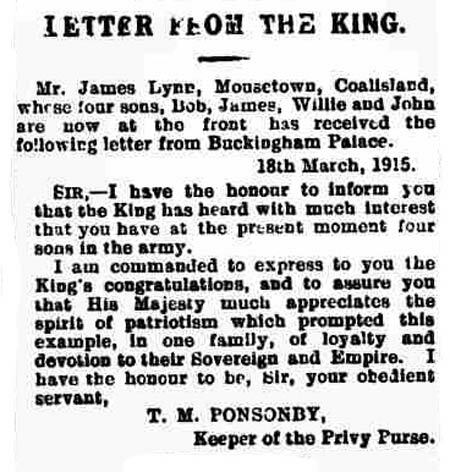 Mr James Lynn, Mousetown, Coalisland, whose four sons, Bob, James, Willie and John are now at the front, has received the following letter from Buckingham Palace. 18th March 1915. 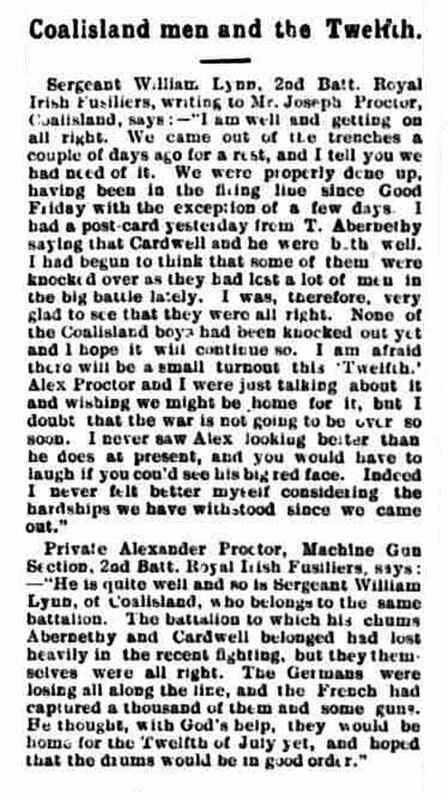 Private Alexander Proctor, 2nd Battalion Royal Irish Fusiliers, writing to his father, Mr Joseph Proctor, Coalisland, says that he and Willie Lynn are of the same company, are quite well, and go to the trenches together. He received a number of letters from Coalisland friends and a parcel of socks, shirts and other comforts from Miss Adams, Torrent Hill, and the members of the sewing class. The parcel came at the right time. His thoughts had been with them on the night of the annual ball in Coalisland, and he had been very glad to know they had a good time. But they would have greater festivities when, with God’s help, they would all arrive safe at home. Private William Lynn also wrote mentioning they had taken part in warding off a great attack by the Germans on Sunday 14th March. It lasted from the afternoon until the following morning, and at times he thought it was all over with them, but he and Proctor had come safely through. It was a terrible position lying in the trenches with shells bursting around them and bullets whistling past and seeing their comrades fall. 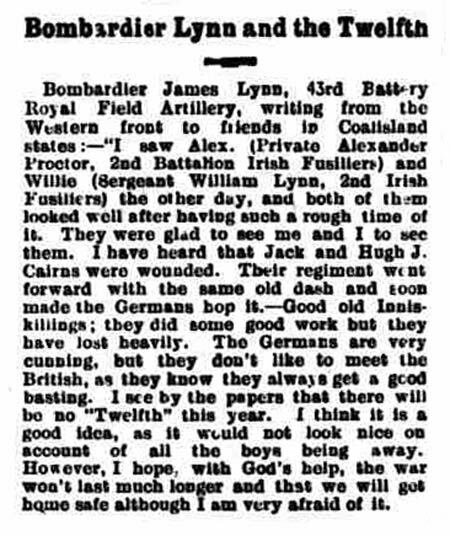 Sergeant James Lynn, 43rd Battery, Royal Field Artillery, also writes to Coalisland that his brother, Willie Lynn, and Alex Procter, are ten miles from him, but they are in the right place for plenty of fighting. There had been lots of fighting, and as the weather was clearing up, much more might be expected. There were a great number of his Orange brethren there from all parts of Ulster, and he could say that they were the boys that feared no noise. 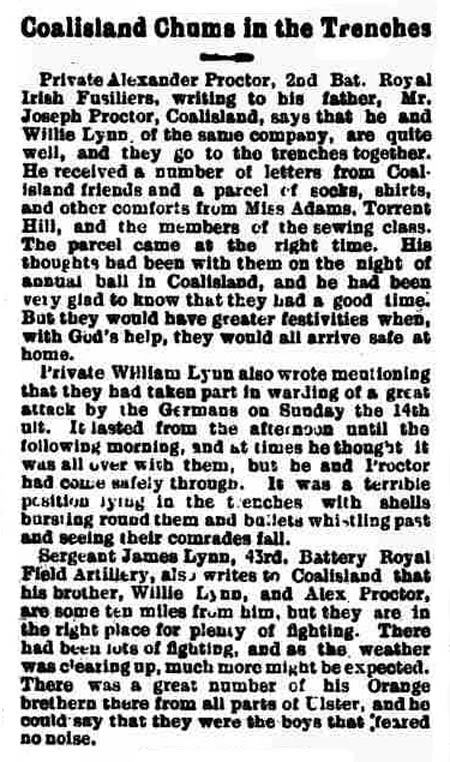 Writing to friends at Coalisland, Sergeant William Lynn, 2nd Royal Irish Fusiliers says he came through all recent fighting safely. On Sunday 14th March, he was sitting in the dugout when at 2:30pm, just as if someone had pressed a button, a tremendous fire was opened by the German artillery and rifles. A mound that his company was occupying was blown up, and for about two minutes, the ground for half a mile in extent shook like an earthquake. The Germans then rushed the English and succeeded in capturing the trenches, which were untenable after the explosion. That was in one part of the British lines; but in another part, the infantry made a most determined stand and kept up such a well-directed fire that the enemy’s losses were terrible. The British stood to their post to the last and were forced back by sheer weight of numbers and the Germans rushed the support trenches and penetrated into a small village. They were not allowed to hold their new positions for long, for a counter attack was made at three o’clock in the morning which however was but partly successful. Another counter attack was made about two hours later when the Germans were completely driven back, except from the mound, where they had placed machine guns. The British artillery, however shelled it with great effect and arms and legs could be seen flying in the air. Those of the enemy who attempted to flee from the mound were fairly bowled over by the British Infantry, who were only some 150 yards away. When morning came, the Germans showed greater humanity than they usually did. They allowed the stretcher bearers to go in at very close range and carry away the wounded and did not attempt to fire on them. Sergeant Lynn’s company were relieved that night for a short rest, which they sorely needed. On Easter Sunday the Germans in the trenches pushed up a sheet of paper on which was written ‘Peaceful Easter’, but five minutes afterwards the British artillery sent them some British eggs (shells) which did not agree with them, as three of their trenches were blown in. Sergeant Lynn states that he is in the best of health and spirits, and hopes, with God’s help, to return home safely. 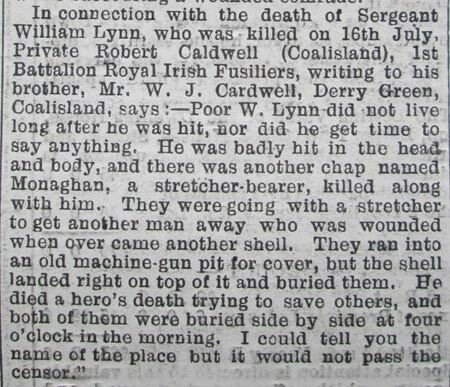 ‘He is quite well and so is Sergeant William Lynn of Coalisland, who belongs to the same battalion. the battalion to which his chums Abernethy and Cardwell belonged had lost heaving in recent fighting, but they themselves were all right. The Germans were losing along the line, and the French had captured a thousand of them and some guns. He thought, with God’s help, they would be home for the Twelfth of July yet, and hoped that the drums would be in good order. On 18th June 1915, Sergeant William Lynn, 2nd Battalion Royal Inniskilling Fusiliers, had his leg fractured and was removed to hospital in Manchester. 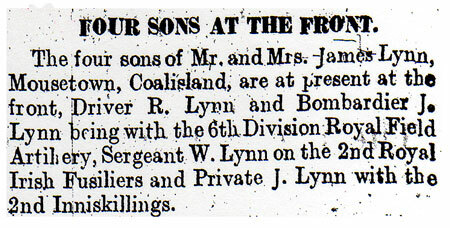 The four sons of Mr and Mrs James Lynn, Mousetown, Coalisland, now fighting in France for King and country. 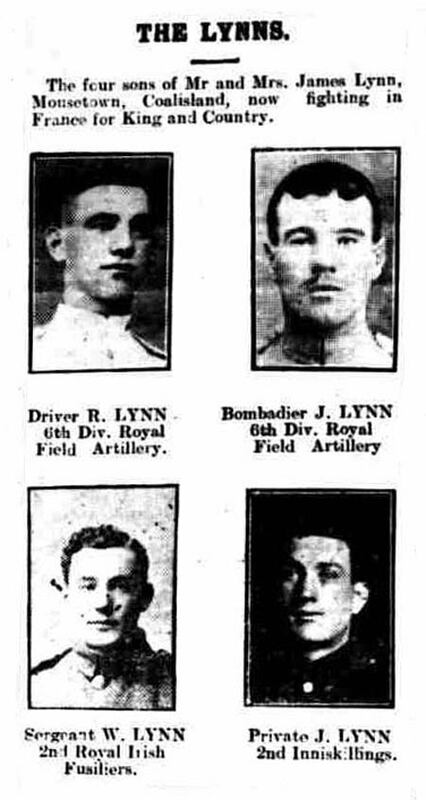 The four sons of Mr and Mrs James Lynn, Mousetown, Coalisland, are at present at the front; Driver R Lynn, and Bombardier J Lynn being with the 6th Division Royal Field Artillery, Sergeant W Lynn on the 2nd Royal Irish Fusiliers and Private J Lynn with the 2nd Inniskillings. ‘I saw Alex (Private Alexander Proctor, 2nd Battalion Irish Fusiliers) and Willie (Sergeant William Lynn, 2nd Irish Fusiliers) the other day, and both of them looked well after having such a rough time of it. They were glad to seem me and I to see them. I have heard that Jack and Hugh Cairns were wounded Their regiment went forward with the same old dash and soon made the Germans hop it – Good old Inniskillings; they did some good work but they have lost heavily. The Germans are very cunning, but they don’t like to meet the British, as they know they always get a good basting. I see by the papers that there will be no Twelfth this year. I think it is a good idea, as it would not look nice on account of all the boys being away. However, I hope with God’s help, the war won’t last much longer and that we will get home safe although I am very afraid of it. Sergeant William Lynn, 2nd Battalion Royal Inniskilling Fusiliers, has written to his parents at Coalisland, stating that he sustained a fractured leg on 18th June, and is now in hospital at Manchester. Sergeant W Lynn, 2nd Battalion Royal Inniskilling Fusiliers, has written to his parents in Coalisland stating that he had his leg fractured on 18th ult. and is now in hospital in Manchester. In September 1915, Sergeant William Lynn and his brother, Private John Lynn, returned home to Coalisland to recover from wounds received in France. 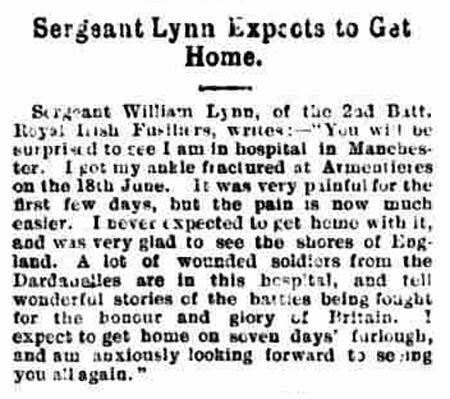 Sergeant William Lynn, 2nd Battalion, Royal Irish Fusiliers and his brother Private John Lynn 2nd Battalion Royal Inniskilling Fusiliers have returned home to Coalisland to recover from wounds received in France. In addition Private Lynn had contracted enteric fever. 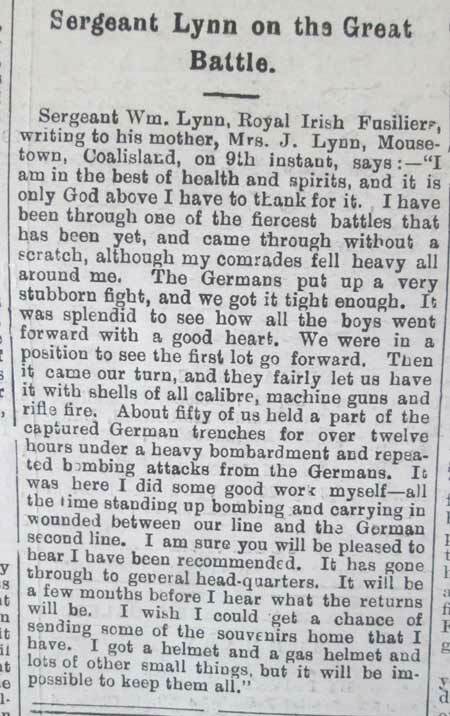 A report in the Mid Ulster Mail from 22 July 1916 reported how Sergeant Lynn had written to his family describing how he had survived the 1st July at the Somme without a scratch. He also reports that he had been 'recommended' for carrying wounded back to friendly trenches. Sadly though, by the time the time the report made the newspaper, Sgt Lynn had been killed in action. Sergeant William Edward Lynn was serving with the 1st Battalion of the Royal Irish Fusiliers when he was killed in action at Mailly-Maillet on 17th July 1916, age 21. 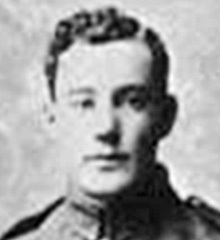 Sergeant Lynn was killed by a shell while carrying in a wounded comrade. Sergeant Lynn had been recommended for his courage and gallantry. 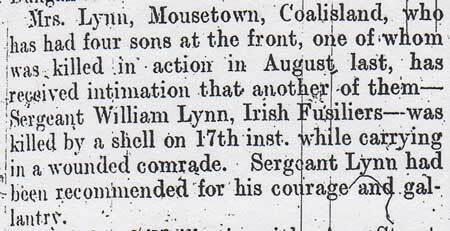 Mrs Lynn, Mousetown, Coalisland, who had four sons at the front, one of whom was killed in August 1915, has received intimation that another of them – Sergeant William Lynn, Irish fusiliers – was killed by a shell on the 17th July while carrying in a wounded comrade. Sergeant Lynn had been recommended for his courage and gallantry. Private William Lynn, Royal Inniskilling Fusiliers, was killed on 16th July. He was the youngest son of Mr James Lynn, Mousetown House, Coalisland, and brother of Private Robert Lynn, who was killed on 6th August 1915. 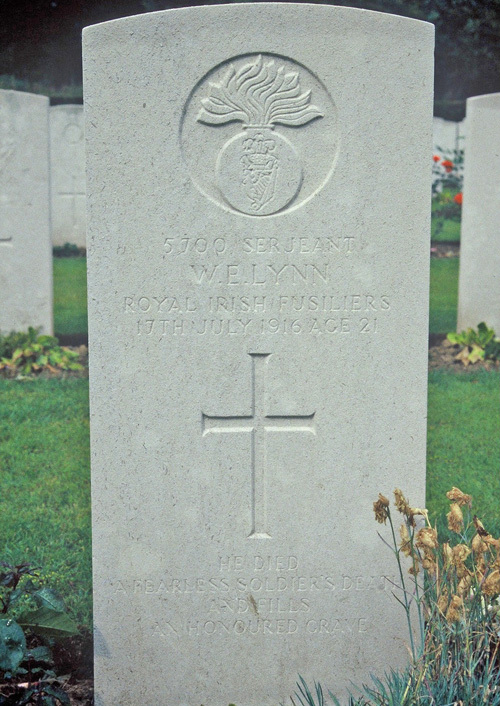 Sergeant William Edward Lynn was one of four brothers who died on service; two are buried in Belgium, one in France and the fourth in Israel. In 1917, a plaque was unveiled in Coalisland Church of Ireland Parish Church in memorial of the Lynn brothers. The original was a beautiful scroll tablet. 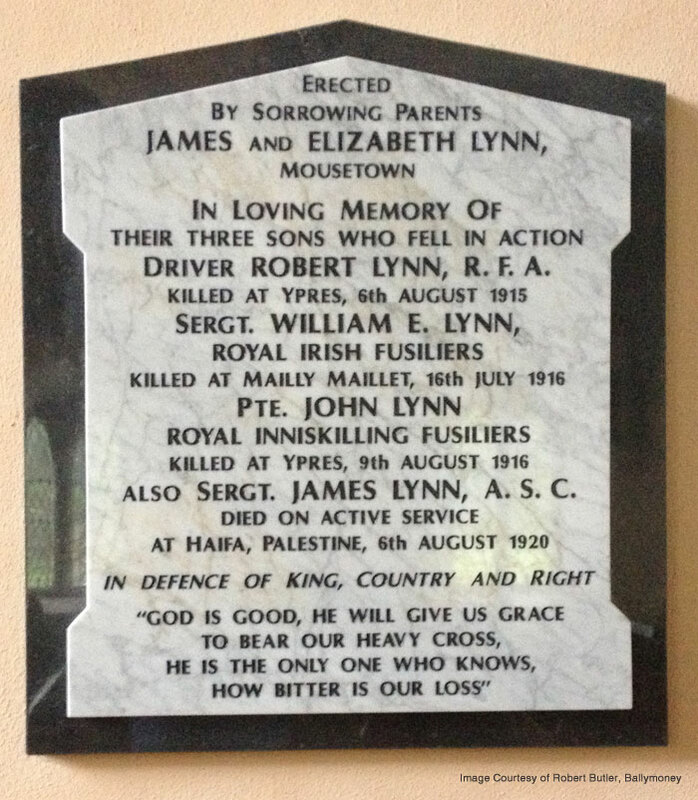 A marble tablet has been erected in Coalisland Parish Church to the memory of the three brothers Lynn, son of Mr James Lynn, of Mousetown, killed in action. Driver Robert Lynn, R.F.A., was killed at Ypres on 6th August 1915; Sergeant William E Lynn, Royal Irish Fusiliers, succumbed to wounds received at Mailly-Maillet on 16th June 1916, and Private John Lynn, of the Royal Irish Fusiliers, was killed at Ypres on 9th August 1916. 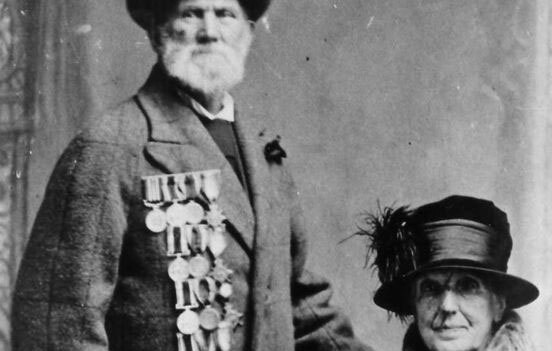 The photo shows the parents of the Lynn brothers, with all four sets of medals. The CWGC record Sergeant William Edward Lynn as the son of James and Elizabeth Lynn, of Mousetown, Coalisland, Co. Tyrone. It also records that he was one of four brothers who died on service during the First World War; two of whom are buried in Belgium, one in France and the fourth in Israel.